Ditch the paper and email process for requests for information, requests for quotes and requests for proposals. Instead, implement an automated RFI/RFQ/RFP process that is secure and fully auditable - making each procurement easier. RFI’s and RFP’s made easy. Simplify your RFI/RFP process with a comprehensive, feature-rich platform. The request for quote module allows you to collect comprehensive supplier information along with bids/quotes. Import documents with Excel and create large bid requests. Allow your suppliers to use Excel to upload large bid quotes. 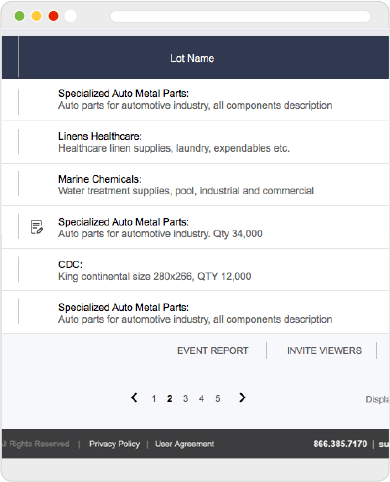 Easily access and compare bids from all suppliers online and run live bid analysis to award business. Contact an expert to receive a free demo of our e-RFX process, or learn more about what ProcurePort can do for your sourcing needs. Stay on top of procurement management news with monthly ProcurePort updates, feature highlights, and sourcing solutions industry insights. Chat with one of our experts to discuss how we can help bring your business idea to life. Its easy to implement your custom auction solution with ProcurePort.